Infatuation is a strong, overwhelming, and powerful feeling that we all have felt at some point. You have just met the “perfect” person and you have fallen head over heels for them. You would give anything to be with this person, you get butterflies every time you think about them, and everything feels like a fairytale. If you are currently feeling this way about your new love interest, you may be experiencing symptoms of infatuation. The intensity of feelings that come with being infatuated may cause you to think you have fallen in love quickly, but have you really? Infatuation is defined as an intense but short-lived passion or admiration for someone or something. The difference between infatuation and being in love comes down to how well you know, trust, and accept someone. Love is confident, selfless, and patient; Infatuation is intense, insecure, and selfish. For many, the infatuation stage moves into love, but sometimes the infatuation can lead to disappointment or the end of a relationship. Therefore, it is important to realize these signs and moderate them to allow your relationship to grow. 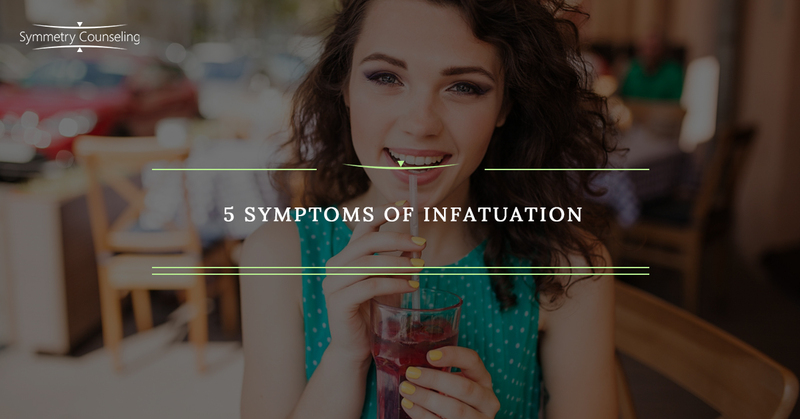 Below are five symptoms to be aware of if you think you may be infatuated. 1. You See and Expect Perfection. Infatuation leads you to believe you have found the “perfect” person as well as the “perfect” relationship. All you can see are their best qualities; their appearance, their success, or their talents. However, you are blind to their weaknesses, insecurities, and flaws. Consequently, when disagreements and arguments arise within the relationship, you feel like things have gone wrong and give up quickly. 2. You Have Persistent and Intrusive Thoughts. When you are infatuated with another, they do not leave your mind. You eat, breathe, and sleep with them on your mind. It is similar to when you hear a new song for the first time and you listen to it on repeat for hours or have the lyrics stuck in your head for days. 3. You Drop Everything for Them. When you are infatuated, you are willing to give up those plans with your friends to have a last minute movie night with your new love interest. You put everything in your life on hold to please or see them. 4. You Become Jealous and Possessive. Are you worried your significant other will be interested in someone else? Do you panic when they don’t reply fast enough to your text? When in a state of infatuation, jealousy and insecurity is common because you are not confident in how they feel about you. 5. You Feel Tired and Alone. Being infatuated with someone is all-consuming. You become exhausted due to constant worry about what they think about you, what they are doing, and stress about things not working out. Things may feel great when you are together, but when you come home, you may feel alone and crave their attention. While there are many times that infatuation can turn into real love, it can be helpful to first understand the true definition of infatuation. This can help you recognize and make sense of your feelings before acting on emotions that may not be true love. If you are currently experiencing symptoms of infatuation and would like the support and skills to decipher if it is love, it may be useful to connect with a therapist. Contact Symmetry Counseling to set up an appointment with one of our very talented therapists at one of our two Chicago locations.